A Brain or Head Injury Calls for Legal Assistance! Dealing with an accident can be physically and emotionally traumatic both for the victim and their loved ones, especially if it has come at the hands of someone else who was negligent. While dealing with the fear that you may not be able to work again or maybe even walk, you must also contend with mounting medical bills, loss of wages, and other emotional scars that come from broken bones, disfigurement, and mental duress. Georgia Brain or Head Injury Victims Have Rights! 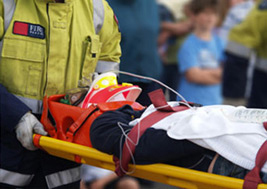 When you are dealing with a brain or head injury that happens on the job, on the road, or anywhere else, you have the right to seek legal assistance that can help you collect damages to not only pay for the medical expenses and lost wages, but you can also be awarded money for emotional distress, pain and suffering, and life-altering injuries. Whether it is a mild concussion or a traumatic brain injury, we encourage you to seek the professional advice and guidance of our team of experienced Injury Trial Lawyers today. Often, the mental fog and physical pain that sets in after an accident, combined with a lack of legal knowledge about personal rights, can cause people to simply accept insurance company settlements. And, often, these settlements are accepted well before the true extent of the head or brain injury is actually known. That means that these insurance settlements for brain and head injuries typically fall well short of the compensation the victim or victim’s family actually deserves. Jonap and Associates, P.C. offers compassionate and free consultations for brain and head injury cases so we can inform you and your family about rights, the type of case you can make, and the potential claim you may be entitled to from such a brain or head injury case. Whether we can garner a better settlement or if we have to go to trial, the brain and head injury case experts at Jonap and Associates, P.C. are here to assist you in every possible way to ensure your rights or those of your loved one are met.